The launch of the AppliedMicro's Catalina SoC for the NAS market was covered here. In a follow up to the initial coverage, we visited AMCC at CES to look at the various reference platforms in action. The Catalina SoC (APM86491) packs a single core Power 465 processor and has a bunch of offload features for accelerated network processing. A host of high speed interfaces (including USB 3.0 host/device, Gigabit Ethernet, SATA and PCI-E Gen 2.0 ports) makes it suitable for consumer NAS systems and wireless access points. At CES, AppliedMicro had three different reference designs (two using the APM86491, and one using the APM82181). The first one, Riviera, was a standard NAS / Media Server design. Malibu, the second reference design, was for a wireless router. 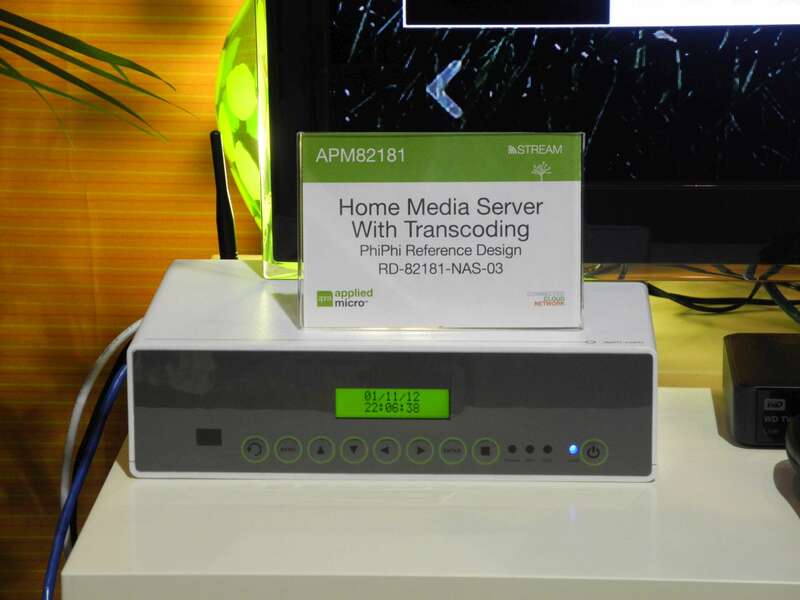 PhiPhi, based on the APM82181, was for a media server with inbuilt transcoding. The Riviera reference design demonstrated was a 4-bay RAID5 NAS. Two drives are connected directly to the two SATA ports on the APM86491. The other two drives are connected to the PCI-E Gen 2.0 ports using a SATA to PCI-E bridge chip. One of the USB 3.0 host ports was connected to an external SSD. There were two GbE ports in the reference design, but only one of them was connected to the PC. designs based on Riviera may give Marvell's NAS platform based designs a run for their money. Another interesting aspect of Riviera was the unconnected USB 3.0 host / device port on the APM86491. A vendor could easily tweak Riviera to expose this as a device port. In that case, the unit would be a NAS / DAS (Direct Attached Storage) combo. The demo also involved accessing the files on the NAS through an iOS / Android app, but it was nothing that I hadn't already seen in action on the My Book Live. 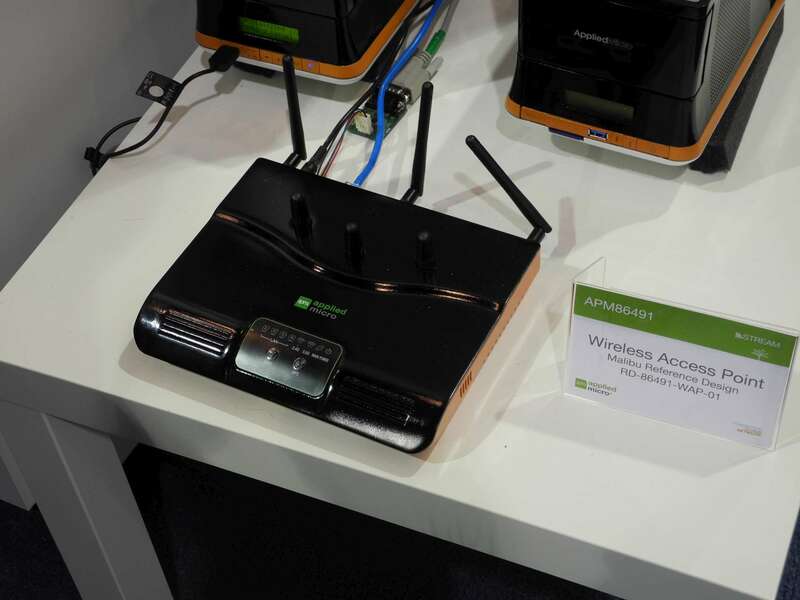 The Malibu reference design demonstrated was a wireless access point with two 3x3 802.11n Atheros Qualcomm radios connected to the APM86491's two PCI-E 2.0 ports. Since the APM86491 includes hardware accelerated network processing, AppliedMicro claimed speeds of upto 650 Mbps in the above configuration (thereby implying that it could scale upto 802.11ac speeds, if necessary).The USB 3.0 host port in the design can be used to attach storage to the router. I haven't seen any router in the market currently based on an AppliedMicro SoC. So, it will be interesting to see if the Malibu platform gets converted into a shipping product. As a media enthusiast, the most interesting reference design was the APM82181 based PhiPhi. It was a home media server with transcoding inbuilt. We had already looked at the details of the APM82181 in the My Book Live review. DLNA renderers which don't implement support for a lot of codecs. In hindsight, the demo could have been more impressive if a mobile device capable of only playing a lower resolution stream was used instead of the WDTV Live SMP. AppliedMicro indicated that one of the PCI-E ports on the SoC was connected to a Zenverge ZN200 chip. Before CES, we saw a joint press release by Zenverge and PacketVideo (developers of the TwonkyServer), indicating that the ZN200 could transcode videos to further expand DLNA support even in the case of very finicky renderers. Another press release by Zenverge suggested that the ZN200 could transcode upto 4 HD streams simultaneously. The only supported formats seem to be MPEG-2 and H.264 on the source side, which could limit usefulness in situations other than those involving just changes in resolution / modification of encode characteristics of MPEG-2 / H.264 videos. The addition of a hardware transcoder to a media server is an interesting development, but the success of such a product heavily depends on performance and price. Of the three platforms demonstrated, this is the one which intrigues me the most. I am looking forward to the market debut of this interesting reference design.